Want An Out Of This World Job? We're Hiring! Click Here for more information! NomNom! - Brand New Food Puzzle Goes Live! 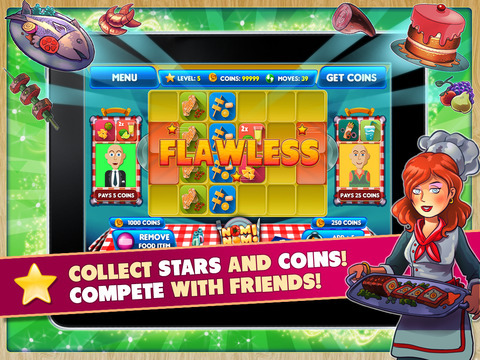 What happens when leading Internet gaming and marketing experts get together and take a cute and clever puzzle app concept, add a splash of “foodie” flair, and offer it to iOS, Android and Facebook users at no cost? 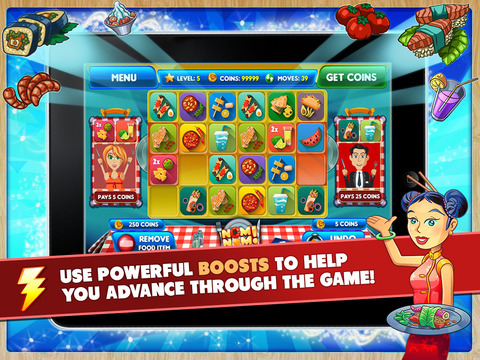 The unique answer is found in Online Gaming Network LLC’s latest creation, which is aptly called NomNom! In NomNom!, users must serve hungry customers in 10 themed restaurants by tapping, sliding and combining tiles, so that ultimately they can serve customers their specific orders before running out of available moves. Users who succeed head to the next challenging level -- there are over 80 in total. Based on their skill, they’re also rewarded with coins, which they can save and spend in order to: add a level, undo a move, remove a food item, or add lives. The more valuable the boost, the more coins it costs. Plus, users who prefer to play through their browser instead of the app can head over to Facebook play with others from around the world.